It has been a joy to be an owner of Cape Ann since 2002 and offer it as a Vacation Rental. Co-owners live in the area and are easy to contact. Calendar is up to date. The cape is an area I love. We lack crowds, traffic, mega-resorts, shopping malls, glitzy nightlife, but - have breathing room and easy access to water and wildlife. It is a nature-lovers dream. Hiking and biking trails in the coastal forest state park plus along Cape San Blas Road are nearby. Bike and kayak rentals are available. Cape Ann sits low in the landscape blending with the surrounding environment. It is within the Secluded Dunes gated community, adjacent to the 2,500 acre St. Joseph Peninsula State Park - which offers 10 miles of undeveloped coast and 35 foot high sand dunes (our skyscrapers). Secluded Dunes borders the state park designated wilderness preserve where a variety of animals and birds share the space. Much of the charm of Cape Ann is - not too fancy, too upscale, too perfect - just presenting a calm, comfortable, 'welcome to the beach' essence. The west side of the property opens to the beautiful Gulf of Mexico displaying a gorgeous white- sand beach and sparkling emerald water. Giant loggerhead turtles annually select the cape for nesting. Most days I am confident you will see dolphins playing off shore and pelicans, sandpipers, and sea gulls sharing the neighborhood. At twilight this is the perfect spot to marvel at the sun dropping silently in the gulf. Following sunset, a beautiful night sky awaits. Many nights shrimp boats may be seen working off shore. The gulf side of Cape Ann features a spacious screened porch. A covered porch runs across the front with a piney woods view. This is my favorite spot for that first cup of coffee. Deer enjoy munching on the lush vegetation which includes beach scrub, live oaks and sabal palms. Cape Ann is a great choice for families who value serenity and natural beauty. It is convenient (ALL ON ONE LEVEL) and inviting with simplicity and ease. When the time is right for a quiet retreat with the sand, sea and sky, you have found the place! Cape Ann is SMOKEFREE, NO PETS ALLOWED and has an Age Restriction. No reservations accepted for vacationing students or singles under age 25 unless accompanied by adult, legal guardian or parent during entire stay. Chaperoned groups not accepted. Restrictions apply regarding number of people a parent or legal guardian may accompany. Please note that we limit the total number of occupants to 8. Owners are sisters who had rented vacation homes in the area several years. It was always fun getting together at a beach house. The Secluded Dunes section of cape offers what we love - privacy, seclusion, natural beauty and quiet space. The name Cape Ann is in memory of our mom and happy times with her at the cape. This home was designed with comfort in mind. One flight of stairs up from the carport and then everything is on one level. Bedrooms are separated nicely for privacy. Two bedrooms have own bath, two other bedrooms share Jack and Jill style bath. Kitchen is quite large with pantry storage. There is a pleasing piney woods view from window above sink. 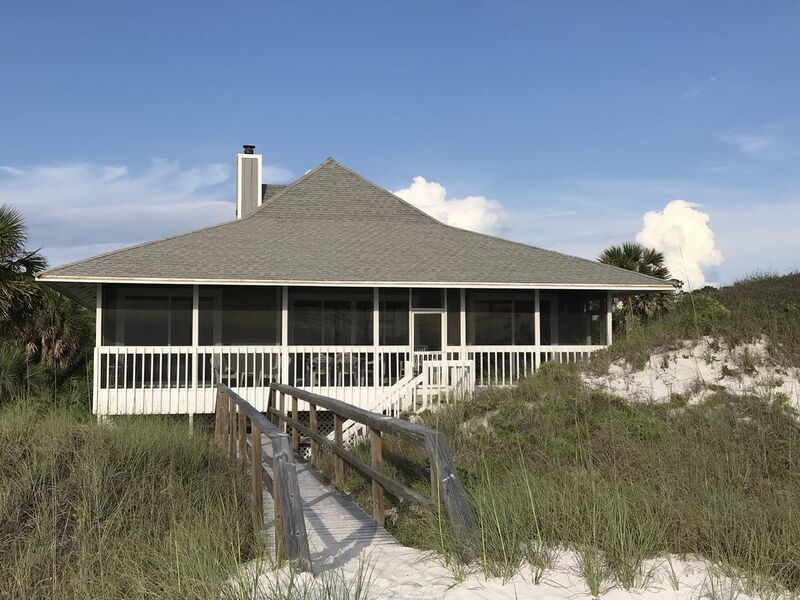 Screened gulf side porch has beautiful view of beach and gorgeous sand dune with wind-swept vegetation. Room in driveway for two vehicles. Bath towels provided. Beach towels are not provided. TV is Gathering Room and each bedroom. Joyce is great to work with, very helpful! Awesome location, quiet secluded, right on the ocean. This was not our first stay at cape ann and hopefully not our last. Unfortunately our trip was cut short due to hurricane Michael. It did sustain some damage, which Joyce is working through. Joyce took care of us and is giving a refund for time not spent there. Great house, great location with a great owner! We had a wonderful time at beautiful secluded Cape San Blas and Cape Ann is very warm and inviting! Our family and friends had a relaxing and fun filled time at Cape Ann! The open, one level living area was conducive to fellowship and entertaining. The views of the beach and it’s easy access made our vacation a most wonderful experience. Love the location! Love the house! Love the screened porch! Love the privacy! Love how easy the check-in and check-out is! Always a pleasure talking with Martha! Seen you next year! Cape Ann was exactly what we were looking for: quiet, secluded, and right on the beach! The house was lovely and very well kept. Joyce and Martha are very organized and wonderful to work with. We loved everything about our stay. We will absolutely be returning to Cape Ann!! We had a great time! The house was a perfect size, clean, & proximity to the beach was great!!! Our home rents on Sunday to Sunday schedule. Short stays and variations considered within 7 days of arrival. Cancellations received prior to 60 days before arrival will incur $100 Handling Fee but remaining amount paid will be refunded. Age Restrictions, No Pets, No Smoking policies are firm.